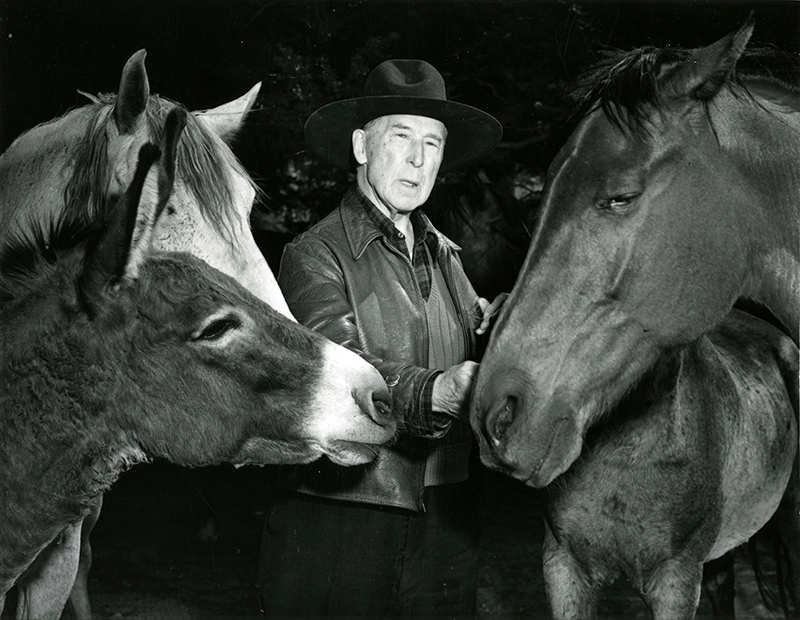 SCVHistory.com LW3169 | William S. Hart | Hart and his Equine Friends, 1940s. Fritz might have been his favorite, but that doesn't mean he loved his other horses any less. William S. Hart had a full stable at his Horseshoe Ranch in Newhall. Judging from appearances, Fritz (1907-1938) would have been in his well-marked grave by the time this scene was captured probably in the mid-1940s — as were some other favorites like Cactus Kate (a mare) and Liz-beth the mule. The animal at right, foreground, might be King Valentine (born Valentine's Day, 1920); the burro at left is probably Tuffy. The last of the remuda to go was Roaney, a gray gelding from Arizona that Hart purchased in 1935. Hart made special dispensation for Roaney in his will: Los Angeles County could have his ranch, but it had to let Roaney live out his days there, and then join Hart's movie horses Fritz, King Valentine and Gentle in the cemetery. Roaney would outlive his saddlepal by more than 20 years. He was said to be the oldest horse in the world when he died at age 45 on April 26, 1968. LW3169: 9600 dpi jpeg from original 6x8-inch International News wirephoto, purchased 2017 by Leon Worden.